One of the more traditional reproduction dining chairs that we offer there is a wheatshief design on the back of the shield. 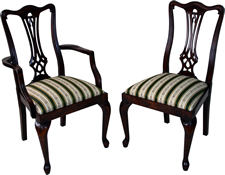 The chairs are available in Mahogany or Yew finish with choice of seats. 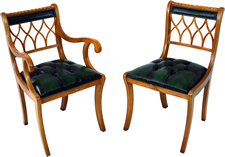 One of the most popular dining chairs with the Prince of Wales Feather baack carving within the shield. 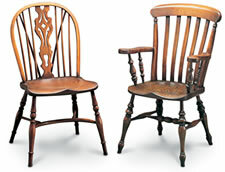 Available as a Single or Carver Chair in Mahogany or Yew finish with choice of seat. This chair has the wheatshief carved detailing on the back. 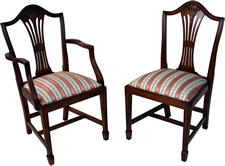 The chairs are available in Mahogany or Yew finish with choice of seats. 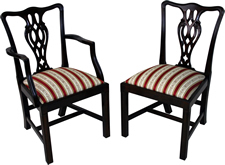 A more contemporary design of dining chairs whilst maintaining the classical style with a beautiful shaped back. 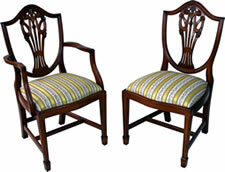 The chairs are available in Mahogany or Yew finish. A great reproduction dining chair and our LOWEST PRICE option available in Mahogany or Yew with a choice of fabric for the seats. A beautiful design with carved rope back above the upholstered or veneered back. 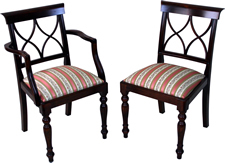 These beautiful dining chairs fit both a classic and more contemporary look. Choice of seats available. The Queen Ann Leg is sometimes referred to as the Cabriole Leg. This is a beautiful antique looking dining chair set and is available in a range of wood finishes including Mahogany and Yew. The traditional Windsor Chairs are available in Solid Oak or Ash and can be polished to a number of shades and finishes. 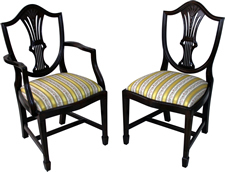 They are traditionally hand made in England using steam bending and lathes to create a beautiful collection of authentic chairs. The Enfield Chair is a great and versatile chair, available with a choice of arms/no arms, buttoned or plain upholster, full or half saddle. The chair is ideal for dining, office seating and occasional settings. All dining chairs are available in the fabrics below, however the chairs can be upholstered in your own fabric, please allow 1 meter of fabric for two dining chair seats. 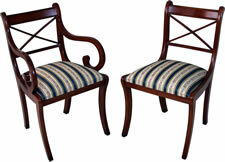 Regency stripe fabric offers a very traditional character to the dining set up. 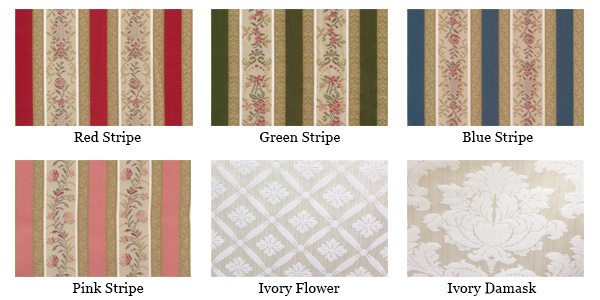 This fabric is very popular with Reproduction Dining Furniture with its charming, timless and classical look. 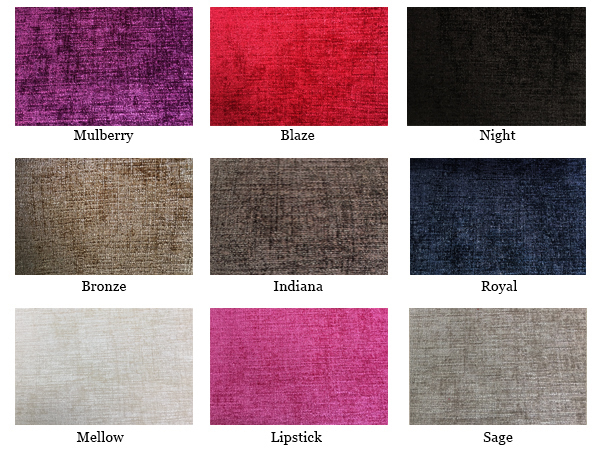 The faux silk velvet has a luxurious soft touch, with an irregular distressed appearance. This is a beautiful quality fabric which looks very elegant for a Dining setup. Traditional antique leather is a hard wearing, classical and elegant option for a dining environment. 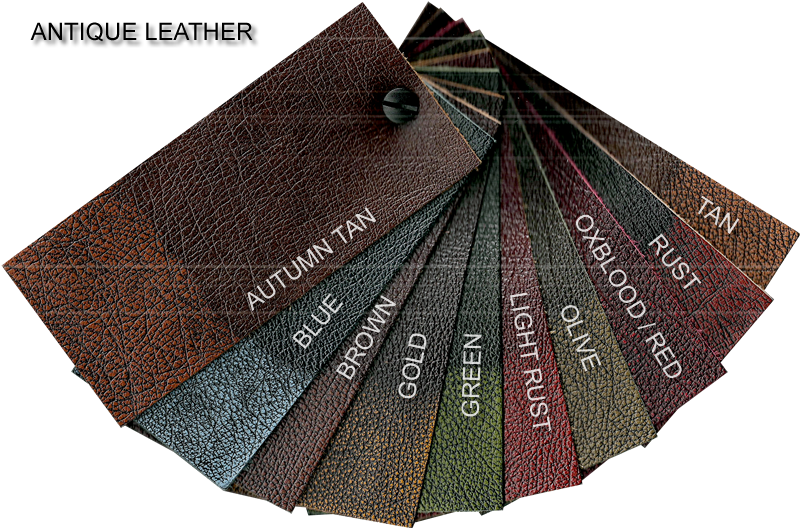 Leather is a luxury alternative to the fabric options and is available in a range of colours.